The striking Akhal-Teke breed has overcome many setbacks during its 3000-year history, but its influence on other horse breeds cannot be denied. Now, the ancient breed is returning to the spotlight, with its athleticism, stamina, speed, agility, and exceptional movement winning admirers. The Akhal Teke is considered to be one of the oldest of modern domesticated equine breeds in existence. The breed as it is known today first appeared in Turkmenistan, Central Asia, in Kara Kum, a rocky, flat desert surrounded by mountains which played a significant role in preserving the Akhal Teke’s purity. Tribesmen of Turkmenistan first used the horses for raiding and they were selectively bred for speed and agility. Pedigree records were maintained orally by Turkomen tribesmen. The Russians printed the first studbook in 1943. Sadly the breed suffered greatly during times of war and at one point only 1250 horses remained. Three other stallions, known as the “Lister Turk”, the “White Turk” and the “Yellow Turk” named after his distinctive golden possibly palomino (dilute) coat carried forth the dilution gene which is responsible for producing the buckskin and palomino coat colours found in some of today’s Thoroughbreds. The Trakehner has also been influenced by the Akhal-Teke, most notably by the stallion Turkmen-Atti, as have the Russian breeds Don, Budyonny, Karabair, and Karabakh. In the early 20th century, crossbreeding between the Thoroughbred and the Akhal-Teke took place, aiming to create a faster long-distance racehorse. However, the Anglo Akhal-Tekes were not as resilient as their Akhal-Teke ancestors, and many died due to the harsh conditions of Central Asia. After the 2600 mile endurance race from Ashkabad to Moscow in 1935, when the purebreds finished in much better condition than the part-breds, the studbook management decided to consider all crossbred horses born after 1936 as part bred. Horses with English Thoroughbred ancestors born before that date were allowed to remain inside the studbook and the stud book was closed in 1975. So why are the numbers so low, given the athletic qualities that this spectacular breed has to offer? One has to ponder the reasons why this rare and beautiful animal, often in spectacular shades of gold with a glimmering metallic sheen to their coat, has not benefited from the same popularity as the thoroughbred in developing and creating today’s modern riding horse. The ban of exports from the Soviet Union played a role to a certain extent, the lack of finance and management of the breed has also had detrimental effects. And some would argue that their less than desirable conformation often portrayed in images of ewe necked, sickle hocked, overly long tubular bodied animals often in a state of malnutrition most certainly has done the breed no favours, either. But the breed is evolving and whilst the Akhal Teke has been primarily bred for racing in Moscow and Turkmenistan, several breeders are now selectively breeding for desirable conformation, temperament, jumping ability, athleticism and movement which will enhance their ability to perform better and compete with success in the FEI disciplines of equestrian sport. 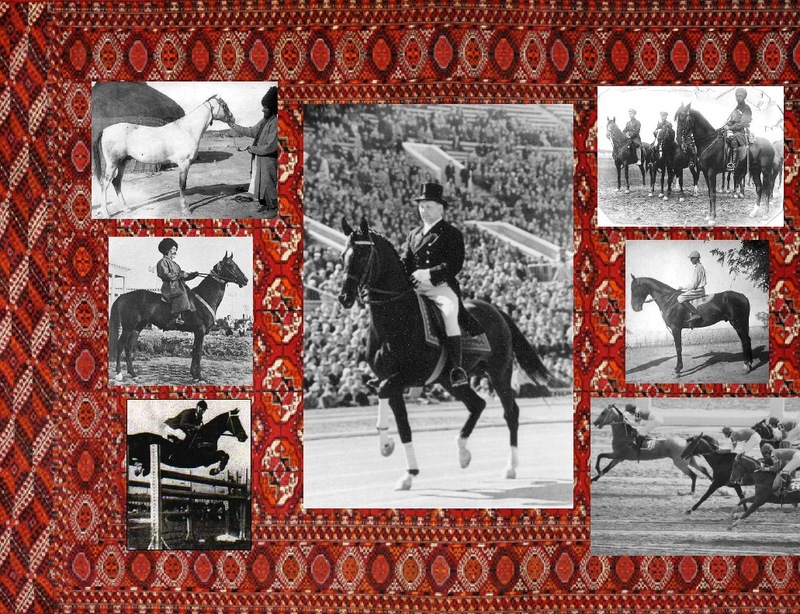 Perhaps now in light of recent developments within the breed it is time to change perceptions and remind ourselves of the success that Sergey Filatow had riding the black Akhal Teke stallion Absent to claim the Olympic Gold medal in dressage in Rome in 1960 for the USSR and recognise that this rare and beautiful breed has and still can achieve excellent results in sport. The Akhal Teke is very much a breed that can be used with success in both part bred and purebred breeding programs, to refine and infuse stamina, heart, toughness, speed and agility and for the pleasure rider or owner, will be a loyal and gentle companion.